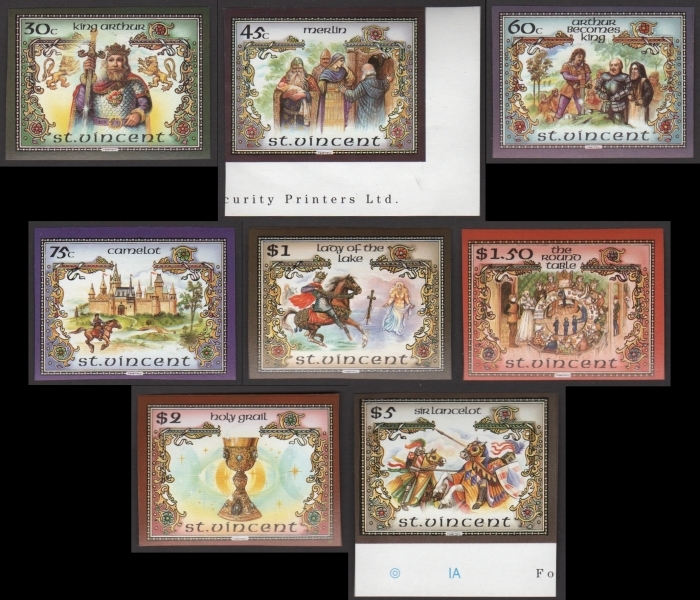 In 1986 the Format International Security Printers Ltd. were commissioned By the St. Vincent postal authorities to produce a set of stamps depicting King Arthur and scenes from the story. The theme being "The Legend of King Arthur" commemorating the story of Camelot and the knights of the round table. 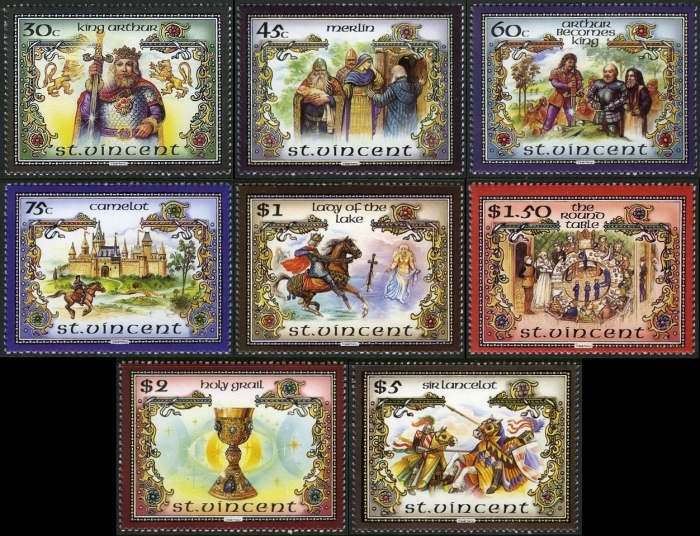 The set of stamps were produced for Saint Vincent only. Saint Vincent issued the stamps on November 3, 1986. This page is for the varieties produced for this issue. In my findings while researching this set I found that the set has definitely been reprinted. This includes the progressive color proofs which is not commonly done by the printers. 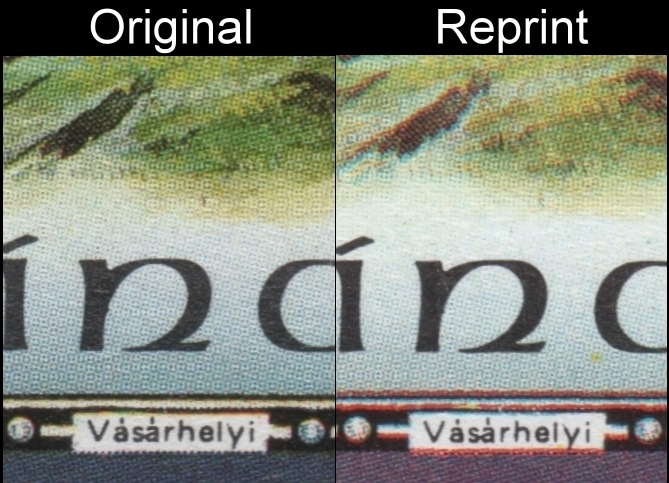 Two completely different sets of color proof stages were created for this issue showing us that the second printing is of a much lighter shading of the colors than the first which makes defining the reprints fairly easy when comparing the stamps side by side. Based on the way the progressives were made originally versus the way they were made in the later printing the evidence shows that the reprinting was done after the Format Printers went bankrupt. This makes them unauthorized reprints which were produced by or for Clive Feigenbaum. See the progressive color proof section to understand this. Sorry to say for some dealers but the varieties of this issue are more common than some portray in their descriptions on internet auction sites and elsewhere and follow basically in the same standards as many other issues produced by the Format International Security Printers. With the release of the police evidence stock in 2008 and the sale of this material on the Saint Vincent side of the stock which was purchased by a single dealer the specimen overprinted sets have surfaced. I note that before this time very few if any were offered for sale and at high prices which has been the way with many varieties produced by the printer. Again it is a dissapointment to some that with the release many varieties of issues mainly being specimens and progressives (which includes the imperforates) and mainly for Saint Vincent and its dependencies, Nevis and Saint Lucia including some issues for Montserrat and the British Virgin Islands, that these varieties are now to be valued at a lower value. The varieties mentioned do still have some value, but the dealers asking high dollar figures for them will have to adjust accordingly. In most cases where they have advertised that "only 10 exist" or "only found in the archive", the statements are just no longer true unless proven with comparisons. Some of these dealers knew the day would come that with the release, some stocks they purchased from the sale of the archive would be devalued. These dealers I would state have not been fully honest with the collecting community if they had this knowledge, nor with other dealers over the past twenty years. Yes a few may have not had any real knowledge of what was in the police evidence stock but according to written letters by the liquidator of the archive....the bigger buyers of the material from the archive and PDC warehouse did know. 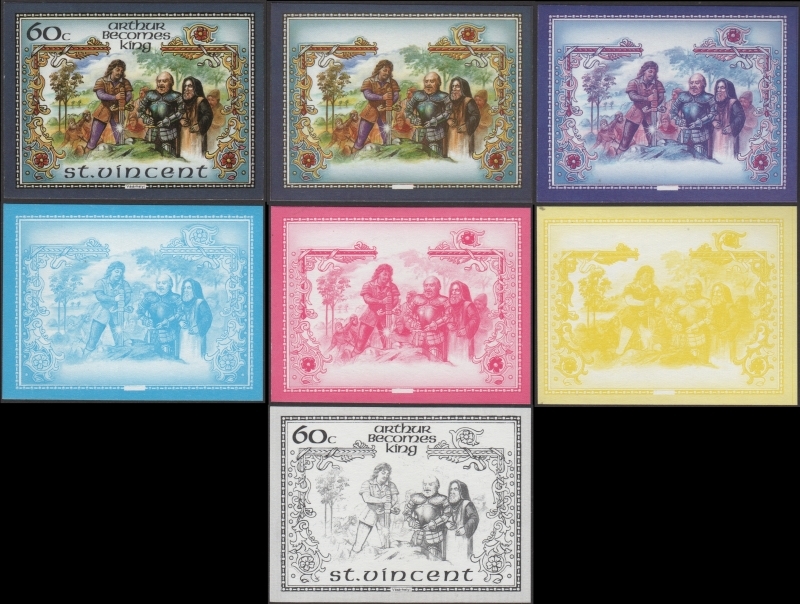 For the normal stamp issue based on the practices of the printer, quantities issued by Saint Vincent, availability of the issue in full panes, and availability of this set on the market in general quantities produced are probably between 100,000 and 125,000 sets. Around 50-75,000 sets are originals and around 25-50,000 sets are the reprints. Pricing should be based on the major catalog values. Now that it is proven that indeed the set was reprinted in the same fashion as others like the Michael Jackson issue and so forth we need to separate those varieties from the original varieties. The originals having higher value because they are rarer. In my purchases of the Bileski Estate I found two intact full uncut press sheets of the four low values of the Legend of King Arthur issue as imperforates and cancelled to order. This variety is noted in the Stanley Gibbons Specialized catalog. Standard printing practices were to produce 2,000 sets perforated and 1,000 sets imperforate. No imperforate varieties seen. The set imaged is from the Saint Vincent side of the police evidence stock. They are originals. I have not seen any specimen overprinted sets from the reprinting and believe that none were made. The quantities sold on eBay of the above set shows that basically all are retained. Pricing should run $4-6.00 for a set of these. Based on market scanning and analysis it is fairly safe to say there are very few. With progressive sets existing though they are out there. 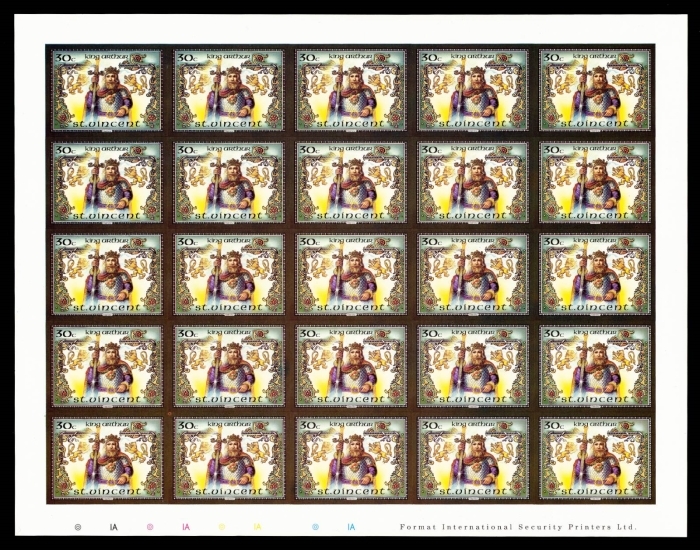 The imaged imperforate proof pane imaged was displayed on an H.R. Harmer auction lot selling a complete set of the progressives. Here is the description. 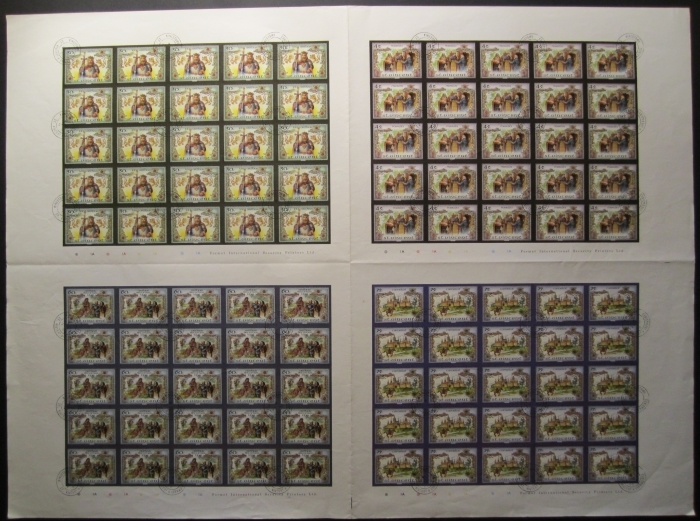 Description: full set of eight values in imperforate sheets of 25, each value seven different trial color proofs (total of 56 sheets or 1,400 proofs), NH, Very Fine. Standard practices of the printer were to produce 5,000 sets with 3,000 more with the progressives. Should it become evident that the progressives were retained in the Saint Vincent police evidence stock or are found elsewhere then sorry to say for the buyer of the above lot, this will greatly devalue them. I do believe this is the case due to the random availability on the market at low prices. It now appears they were not in the police evidence stock though and thus may be rarer than we think. Pricing generally would be $5-7.00 a set, but with the low availability on the market one can expect to pay higher for these. This is where I found the real evidence of reprinting was done. I show images below of examples of the two types of progressive color proof runs. As you can see the process is very different. On the unauthorized reprint run there is no final all color stage without denomination and inscriptions but rather the blue/red stage with black. On the unauthorized reprint run there is no blue/red stage but rather a blue/black stage. The original run is the seven stage type of run that was used in 1986 by the Format Printers. No progressive sets were ever made by the Format Printers like the unauthorized reprint set. Now let's demonstrate a bit further with some side by side images of the basic colors. As you can see there is quite a difference. When all colors are combined the stamps have definite color variances. I have found and purchased several sets of the unauthorized reprint progressives. At this time it seems the originals are harder to come by. Some of the unauthorized reprint sets appear to come from press sheets due to large selvage attached. It is possible that like the specimen overprinted stamps the originals may be still in a stock and have just not been made available yet. Basing on the standard practices of the printers 3,000 sets of originals and 3,000 sets of the reprints would have been produced. Pricing should run at $20-25.00 for each presentation folder (velvet covered) since they are restricted to 250 if they exist. Pricing for a full set of any one individual value as progressives should run at $3-5.00 a set. At this time there appear to be no "errors" for this issue although the two different progressives (blue with black as example), if perforated would be considered "made for collector" missing color errors. The gum on the reprints is slightly whiter than on the originals. With this issue it is dangerously close to the originals type of gum and must be looked at closely to be able to see the difference. Note the extreme difference in color on the unauthorized reprint stamp. The screen pattern is very close to the original showing us that the printer must have had access to the original screens for this issue. Note the red color overlapping the black lines. This alone defines the unauthorized reprints versus the originals. 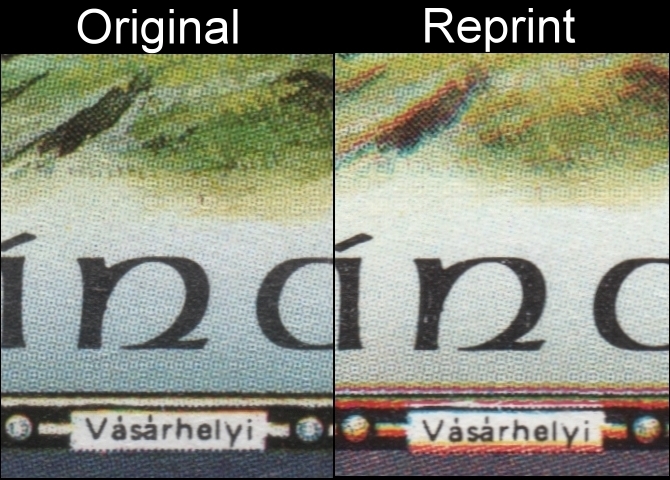 The detail is blurred on the unauthorized reprints and you can see the originals have much more intense colors than the unauthorized reprints. The red color overlapping the black lines again is very pronounced but different showing the poor quality of the unauthorized reprinting. 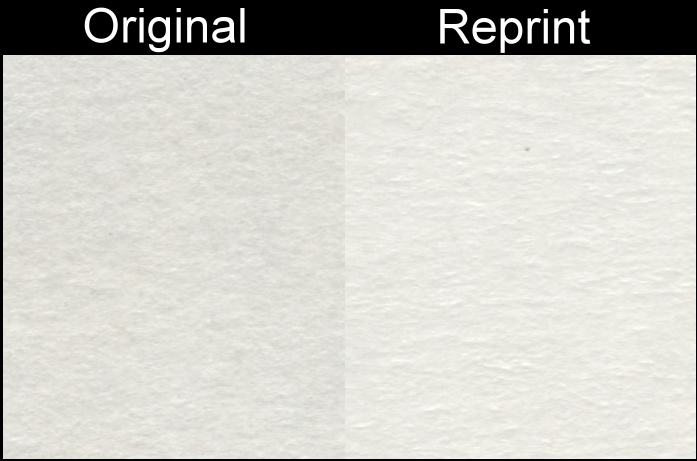 I will now show images of the final progressives from the unauthorized reprinting next to the specimen overprinted stamps from the original printing so you will be able to see the differences between the two types. As you can see there is quite a huge difference on most of the stamps outer frame colors. It holds true for the whole stamp in general. This sums up the demonstration on how to identify the unauthorized reprints of the St. Vincent 1986 King Arthur stamp issue. I must stress the point that you do not have to be an expert philatelist to be able to do this. You do not even have to be a collector at all! The differences between the original stamps and the unauthorized reprints are quite obvious. 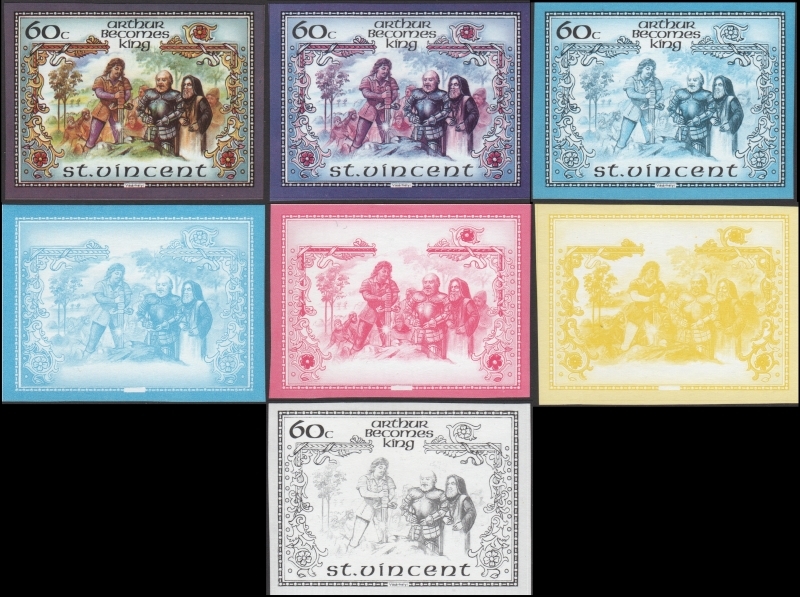 I hope that this reference page on the Saint Vincent 1986 King Arthur unauthorized reprint stamps will assist all collectors, dealers and memorabilia collectors in defining and chosing which sets they have or are buying. Here are links to other stamp issues that were discovered to have been reprinted in the early 1990's after the Format International Security Printers went Bankrupt.